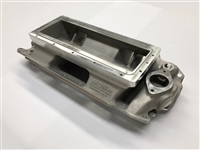 This intake manifold is designed to fit 1958-1965 Chevrolet 348/409 "W" big-block engines with 690 style large port heads including: Edelbrock #60809 or #60819 and Bob Walla cylinder heads. 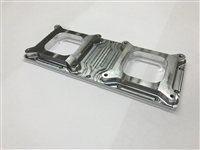 Blower version comes standard as RACE PREP, if you would like front water threaded holes added please specify at checkout and allow 5-6 days for machining. Base intake does not include a top, you must also purchase the top of your choosing from our catalog. Race prep version does not include oil filler tube hole and front water tapered pipe tapped holes.